Since 1989, Sound + Image, the prestigious Australian audio publication, has been recognizing the industry’s finest amplifiers, receivers and loudspeakers with their annual Sound + Image awards. Each worthy component is evaluated based on their features, quality build, appearance, and ease of use. 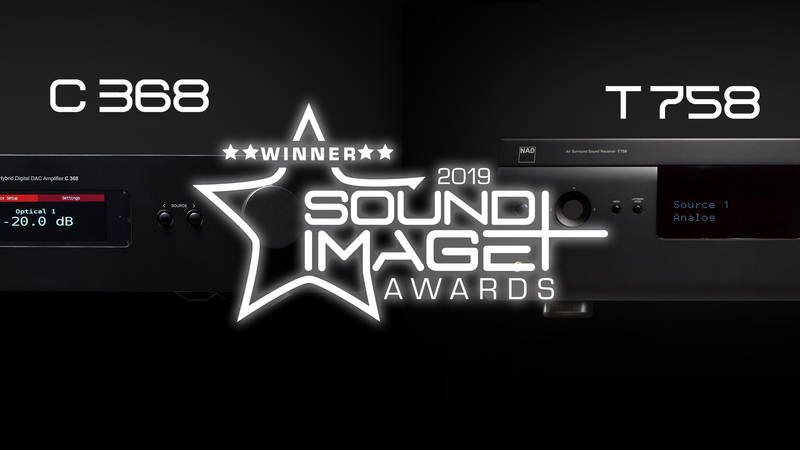 This year, Sound + Image have awarded NAD with not one, but two awards for the NAD C 368 Hybrid Digital DAC Amplifier, and the NAD T 758 V3 A/V Surround Sound Receiver, respectively. Taking home the gold for Amplifier of the Year, the NAD C 368 has already received accolades from The Absolute Sound and AVS Forum. Described as a “tour de force” by AV Nirvana, the C 368 is ready for all future upgrades thanks to NAD’s Modular Design Construction (MDC) technology. With the added bonus of having BluOS, the NAD C 368 is the ultimate amp for any music lover’s system. Winning a Highly Recommended award in the AV Receiver category, the NAD T 758 V3 has also had its fair share of honours, including a Top Pick award from Sound and Vision. With full support for High Res Audio formats like MQA, and innovative technologies such as Dirac Live, the T 758 V3 will bring your favourite movies and music to life.